A pinwheel block is such a simple, yet striking block, especially in a sampler quilt. This is such fun one that could be great if you used all of the same fabric, 4 different fabrics as pictured, or something completely different. (8) total 2 1/2″ x 2 1/2″ squares – If you want to make your block as pictured, cut 2 blocks each of 4 prints to total 8 squares. Draw a diagonal line down the center of the background square. Pair up each background square with a print. Sew 1/4″ away from center line on both sides of the line. Trim down the center, press, and trim to 2″ square. Assemble your block as pictured. This sailboat block was one I wanted to include for sure since I live in a house full of boys, and man do I love every minute of it. Draw a diagonal line down the center of the 2 x 2″ sky and the 2 3/8″ x 2 3/8″ sky pieces. 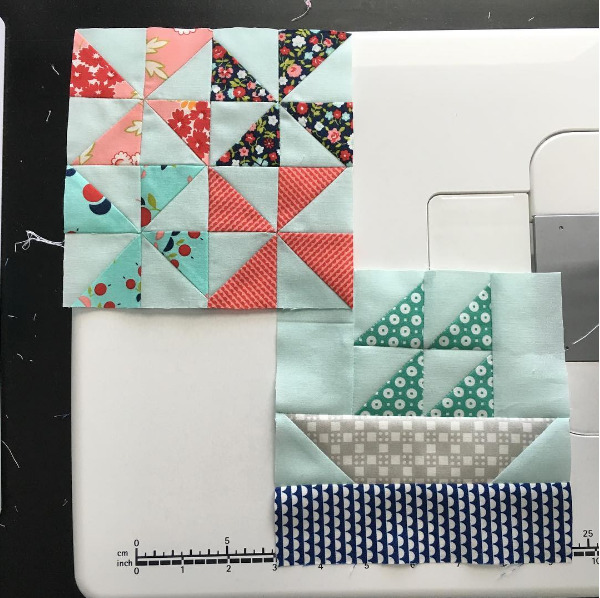 Pair up the 2 3/8″ x 2 3/8″ sky and sails squares. Sew 1/4″ away from the center line on both sides of the line, cut down the line, press, and trim to 2″ x 2″. Pair up the boat piece with the 2″ x 2″ sky pieces. Make sure you arrange the sky pieces so they will give you the correct boat shape. Sew ON the line this time, trim away excess leaving 1/4″, press. Assemble the block as shown above.